Sweet paprika seed oil There is 1 product. 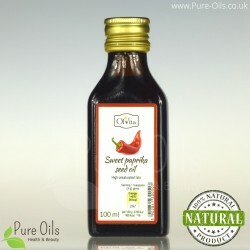 Sweet paprika seed oil is an unrefined and cold pressed product. The main advantage of this oil is high content of polyunsaturated fatty acids 74% (linoleic acid) and carotenoids.